Local and regional dignitaries take part in the ribbon cutting to open the Clinton Keith Road extension on Friday. 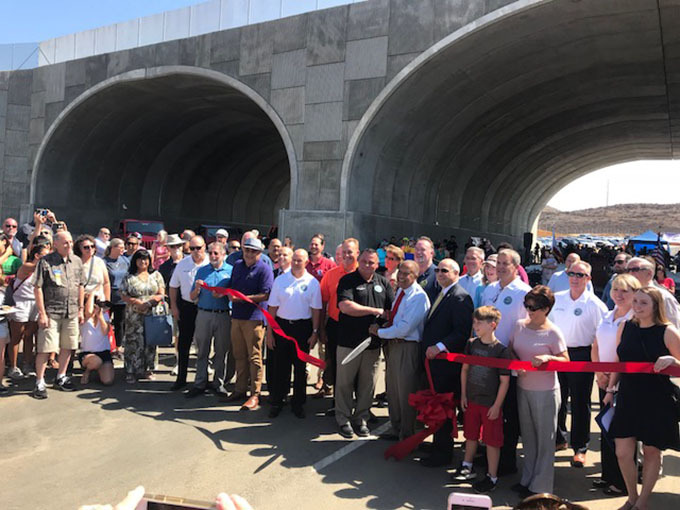 One of the most important Southwest Riverside County traffic routes to open in years was celebrated on Friday in a ceremony near the east end of the Clinton Keith Road extension. The project, nearly two years in the making, extends Clinton Keith Road from Whitewood Road to the west with Leon Road to the east, enabling motorists to travel from the west end of Murrieta all the way east to Winchester Road. Until this road opened Friday afternoon, east-west travelers had to use Scott Road far to the north, a curving two-lane Los Alamos Road, or Murrieta Hot Springs Road to the south. 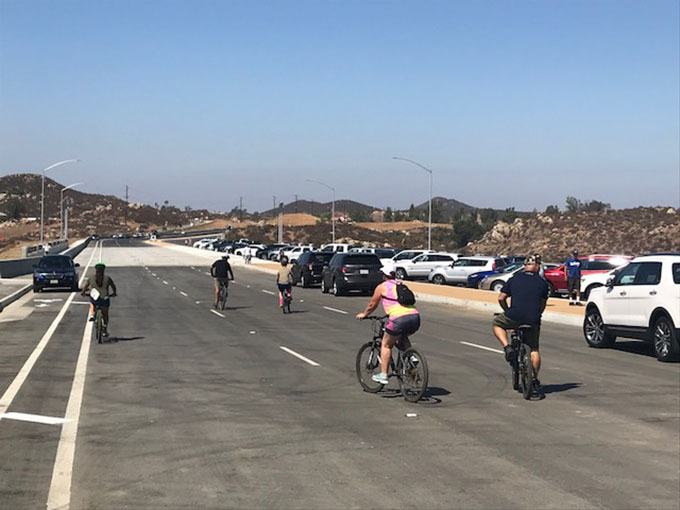 The road is three lanes wide on each side with bike lanes, a traffic signal installed at the intersection with Menifee Road, and a bridge spanning the road with Riverside County's first wildlife crossing to help protect animals in the area. 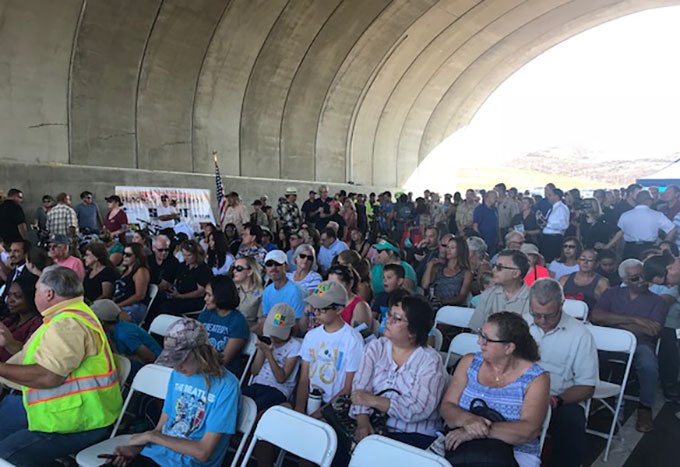 Close to 500 people gathered in the shade under that wildlife crossing bridge for a ceremony that included representatives of the Riverside County Board of Supervisors, Riverside County Transportation and Lane Management Agency, Western Riverside Council of Governments, and the Western Riverside County Regional Conservation Authority, in addition to officials of several local cities. "I don't think we anticipated this big a turnout," said Riverside County Supervisor Chuck Washington. "It's an indication of how important this project is. This is so important to this region and literally will impact the lives of 100,000 people. To get some of those people dispersed as they travel through the area is of great benefit to their lives. "With projects like this, we give people alternatives in how they get where they need to go. It also demonstrates how regional partnerships can be so effective. We have representatives from the City of Murrieta, Temecula, Menifee ... they've all had some stake in making this project a success. I couldn't be more proud of how we get things done when we work together." Murrieta Mayor Jonathan Ingram expressed his excitement about the project. "This project will enhance the quality of life for all the residents in this area," Ingram said. "It will alleviate a lot of the traffic on Highway 79 and Murrieta Hot Springs Road." Ingram also thanked Juan C. Perez, Riverside County Transportation Director, without whom he said "this project would not exist." Hundreds of guests listened to government officials speak during Friday's ceremony. Bicyclists head west to check out the new stretch of Clinton Keith Road before it is opened to auto traffic.